Volunteers play a critical role in helping the Huntsville Botanical Garden grow. A dedicated group of volunteers works closely to aid our excellent staff in creating the most wonderful guest experience possible. Whether you are looking to volunteer individually or as a group or corporation, we have opportunities for everyone to explore new interests, share your talents, and meet new people. Today, volunteers donate not only their amazing skills and knowledge, but thousands of hours collectively to help with special events, grounds maintenance, visitor services, education program and so much more! Please join our Garden team and volunteer today! View our volunteer brochure here! The Garden depends on the family of volunteers it has been nurturing since its establishment. With the growth of the Garden, our family needs to grow as well! We have volunteer opportunities in several different departments, offering a variety of fun Garden experiences. Volunteer hours are great for the community and the Garden, they are fabulous for a resume, and we offer relationships that can last a lifetime. Exciting volunteer opportunities exist in virtually every area of the Garden. No experience is necessary for most positions, and training will be provided. For seasonal volunteer needs, please check out The Columns Newsletter or click the green button labeled “Current Volunteer Opportunities” to see a list of current needs. The Garden’s special events are critical to our success, helping to increase funding while raising public awareness of the programs and activities of the Garden. 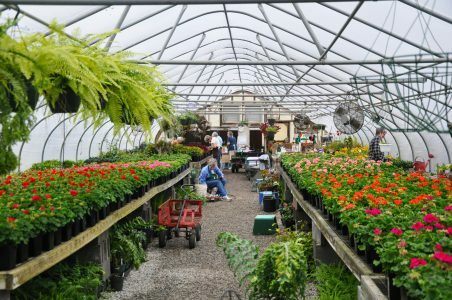 Spring and Fall Plant Sale, Bunny Bonanza, Scarecrow Trail, Bootanica, and Galaxy of Lights are just a few of the events that require a large team of volunteers to help the events run smoothly and efficiently. Assignments include event preparation, greeting guests, assisting with activities and games, serving refreshments, and clean up. This area has the most volunteer flexibility, and adults and teens are invited to get involved. Like any busy office, the Garden always needs organized individuals for administrative support. From database entry to the preparation of large mailings, there are always routine office tasks for an additional pair of hands! Docents are special Garden ambassadors that lead tours for both children and adults and assist in classroom workshops for thousands of school children each year. They have a direct impact on achieving the mission and goals of the Garden. They Care! As a Docent, you will have limitless opportunities to share your sense of wonder as you connect with people of all ages! Becoming a Garden Docent is a volunteer position that requires extensive training and an ongoing commitment, and in return, the Garden’s staff strives to give each Docent a satisfying, productive, and rewarding experience. Please visit the Docent webpage for more information. This volunteer serves as a greeter at the front desk, welcomes visitors, collects admission and presents information about the Garden—all while providing exceptional customer service. Assisting guests with merchandise and sales in Shoppe at the Garden and answering phones are other necessary and fun duties. Training is required. Attend a two-hour training session and become a shuttle driver. Give guests a ride through the Garden on a golf cart while sharing information about its history. Assist staff with events in the Garden’s rental facilities, such as weddings, corporate meetings, and party planning. Under the direction of the Horticulture staff, participate in day-to-day activities from planting, landscaping, weeding, watering and mulching to other grounds maintenance and expansion projects. If you like hands-on experience in pruning, native plants, perennials, annuals, and even weeds, become a gardening volunteer. View and complete the Volunteer Application . If under the age of 18, complete the Youth Volunteer (Volunteers must be a minimum of 14 years old and accompanied by a guardian if younger than 16). If you are able to edit the PDF, then attach the completed form to an email and send to cadams@hsvbg.org. If you are not able to edit the PDF file, please print and mail to Huntsville Botanical Garden, Attn: Volunteer Coordinator, 4747 Bob Wallace Ave., Huntsville, AL 35805 or fax to 256-830-5314. If you have any other questions concerning volunteering, please contact the Volunteer Coordinator at volunteer@hsvbg.org or 256-830-4447 ext. 238. Already a Volunteer and looking to turn in your volunteer hours? Complete this Volunteer Log and e-mail to volunteer@hsvbg.org or fax to 256-830-5314. "I love being outdoors and the Garden provides an opportunity to enjoy that activity, with the added plus of seeing the beauty of the Garden as it changes from week to week. The opportunity to meet and talk with interesting folks, some visiting from far-away or foreign countries, is another benefit I enjoy." "I volunteer because I enjoy being in a beautiful place, meeting new people and giving back to the community. People come from all over and I love showing them our bit of heaven!" "I love learning something new every day, and I definitely achieve that at the Garden"
"If you ask me why I work so hard for a little train and spend so much time in this small niche of the garden... it's because of the joy I can bring to children (the future of the garden), the joy and memories I kindle in adults, and the friendships I've made with visitors and neighbors. I am giving back to the Garden and the community by volunteering."